1.Preheat the oven to 180°C. Season the flour with salt and pepper. Pat beef dry with absorbent paper and sprinkle with the seasoned flour. Heat a large frypan over a medium-high heat, add a little oil. Brown the beef on all sides. Remove and place beef in a large, deep casserole dish. 2.Soak the porcini mushrooms in the boiling water for 10 minutes. Drain, reserving the soaking liquid. Roughly chop the porcini and set aside. 3.Reheat the frypan, add a little oil, add the onion and cook for 5 minutes over a medium heat until golden. Add the garlic, rosemary, wine, beef stock, porcini and soaking liquid, stirring up residue from the base of the pan. 4.Bring to the boil, remove from heat and pour over the beef. Cover casserole dish tightly and cook for 1½-2 hours or until very tender. Turn the meat over halfway through the cooking time.Just before serving, heat the butter in a frypan, cook the mushrooms until golden. Stir into the casserole dish. 5.Cut the beef brisket into thick slices and spoon over the cooking liquid. 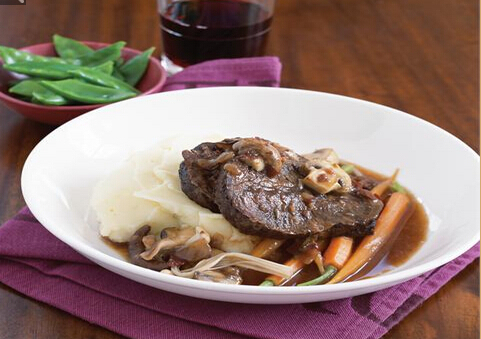 Serve with mashed potato, baby carrots and parsnips.